Sweet Cheeks and Savings is helping promote this giveaway! Going flameless was one of the best things I've ever done. I avoid black soot from candle wicks and wax melts scents fill out my house with a strong throw that lasts more than one day. It's safer than candles and easier to ship! I do love the dance of a candle wick on occasion and use a candle snuff to put out the wick, but I love wax melting so much more! If you haven't tried it yet, now is the perfect time to enter for your chance to! 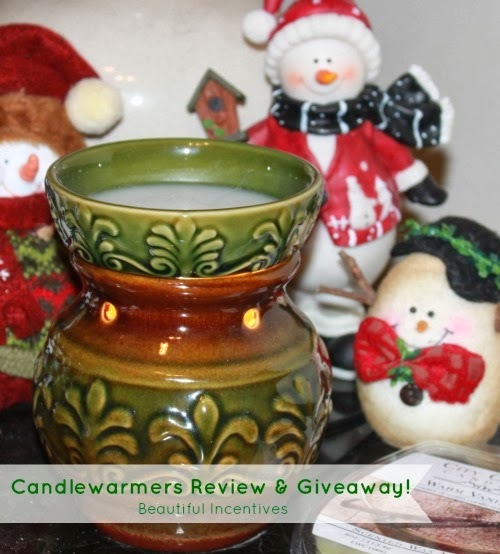 Courtesy of Candlewarmers, one lucky winner will receive a melt warmer like the beautiful Illumination Green Fleur De Lis reviewed here and pictured above. Sweet Cheeks and Savings is not responsible for prize fulfillment. This review and giveaway is in accordance with FTC Guidelines. I like the Bless This Home warmer! Thanks for the giveaway!